Georgia Senate Bill 136 was signed into law on April 23, 2013. Part of the new Georgia Law, amended the law on personal watercrafts (jet ski, wave runner, etc.). One of the main amendments was regarding the age requirements, expectations, for operating a personal watercraft (PWC). 2. The child is on the PWC with someone 18 or older who is legally allowed to operate the PWC. The previous age exception of a responsible adult being ˜within 400 yards of the child on the PWC has been removed. The changes to the Personal Watercraft Law were brought about after a child fatality that was attributed to a PWC operator without experience of knowledge of the PWC struck a child after operating too close to the child. The new PWC and Boater Education Law Kile Glover Boat Education Law was named in the child’s honor. The intent of the new PWC and Boater Education Law is to have reasonable restrictions on people operating a vessel on a public waterway via education and child protection. Also, the new law makes it so that no one shall rent or lease a vessel with more than 10 horsepower to a person under 16. Additionally, effective July 1, 2014, any renter must have taken a Boating Education Course in order to rent or lease any vessel 10 horsepower or more, with certain limited exceptions. Further, the ˜accompanying adult language regarding the need for not being under the influence adds language of under the influence of toxic vapors, which is reflective of Boating Under the Influence changes that are now more in-line with Georgia Driving Under the Influence laws. 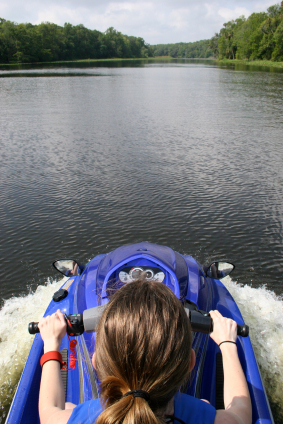 Operator inexperience is one of the leading causes of personal watercraft accidents on Georgia Lakes. (1) ‘Accompanied by’ means in the physical presence within the vessel of a person who is not under the influence of alcohol, toxic vapors, or drugs to a degree which would constitute a violation of Code Section 52-7-12 were such person operating the vessel. (2) ‘Class A vessel’ means a boat less than 16 feet in length. (C) Has the probability that the operator and passenger may, in the normal course of use, fall overboard. “(l) On and after June 1, 1995, no No person under the age of 16 years shall operate a personal watercraft on the waters of this state; provided, however, that a person age 12 through 15 years of age may operate a personal watercraft if he or she is accompanied by an adult age 18 years of age or over older or he or she has successfully completed a personal watercraft safety program boating education course approved by the department or is under direct supervision by an adult age 18 or over. The department may, but shall not be required to, conduct or provide personal watercraft safety boating education courses to the public. (a) A person age 16 years of age or over older may operate any vessel or personal watercraft on any of the waters of this state if such person has met the applicable requirements of Code Section 52-7-22, and such person shall have has in such vessel proper identification. (C) Is under direct supervision by an adult age 18 or over. (b)(2)(A) through (b)(2)(C) of this Code section. Such person may operate a personal watercraft in compliance with Code Section 52-7-8.2, and such person may operate nonmotorized Class A vessels without restriction No person between 12 through 15 years of age may operate a Class 1, Class 2, or Class 3 vessel. (d) No person under the age of 12 years shall operate any Class 1, 2, or 3 vessel or any personal watercraft on any of the waters of this state, and no such person shall operate any Class A vessel utilizing mechanical means of propulsion exceeding 30 horsepower. Such person may operate a Class A vessel, other than a personal watercraft, utilizing mechanical means of propulsion not exceeding 30 horsepower only where such person is accompanied by an adult age 18 years of age or over older who is authorized to operate such vessel under the provisions of subsection (a) of this Code section. (e) No person having ownership or control of a vessel shall permit another person to operate such vessel in violation of this Code section. (f) No person shall rent, lease, or let for hire any vessel ten horsepower or more to any person under 16 years of age. On and after July 1, 2014, a person 16 years of age or older may rent or lease any vessel ten horsepower or more if such person has completed a boating education course approved by the department. This subsection shall not apply to any person licensed by the United States Coast Guard as a master of a vessel or a nonresident who has in his or her possession proof that he or she has completed a National Association of State Boating Law Administrators approved boater education course or equivalency examination from another state. (2) ‘Personal watercraft’ shall have the same meaning as set forth in Code Section 52-7-8.2. (3) ‘Proper identification’ shall have the same meaning as in subsection (d) of Code Section 3-3-23, relating to furnishing of alcoholic beverages. (3) ‘Under the direct supervision’ means within sight of and within 400 yards of a person who is not under the influence of alcohol or drugs to a degree which would constitute a violation of Code Section 52-7-12 were such person operating the vessel and who is aware of his or her supervisory responsibility. The new Georgia Law is designed to help protect children from themselves and from injuring others due to inexperience while on a personal watercraft (PWC).